"I wouldn't take that values test either." Patty Hajdu, Minister of Employment, Workforce Development and Labour stands during question period in the House of Commons on Sept. 19, 2017. 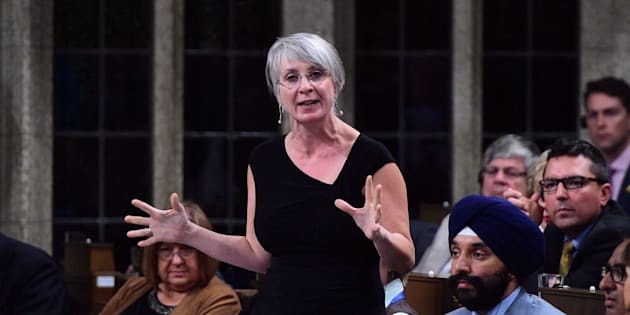 A Conservative MP's call for the Liberal government to remove a so-called "values test" for summer-jobs grants spurred Labour Minister Patty Hajdu to question if her colleague opposes reproductive freedom. The first question period since Parliament resumed from a six-week winter break turned heated Monday after Tory MP Karen Vecchio flagged an issue that has concerned faith-based groups and outraged social conservatives. Under new rules for the Canada Summer Jobs program, which provides grants to employers to subsidize the costs of hiring students, organizations are now being asked to affirm that their core mandate respects, among other things, reproductive rights and LGBTQ rights. Churches and faith-based groups are still permitted to apply for funding, Liberals say, but must sign an attestation stating they respect "the right to safe and legal abortions." Religious leaders have said that doing so would run counter to their beliefs and values, even if the programs for which they are seeking funding have nothing to do with abortion. Vecchio charged that the government is effectively denying funding to groups seeking to help at-risk youth, run daycares and provide aid to refugees. She called on Liberals to "finally remove this values test from the Canada Summer Jobs application." Hajdu shot back that, "unlike the Harper Conservatives," Liberals know funding should not go to work that seeks to "actively undermine" Canadians' rights. As an example, she pointed to one anti-abortion group, the Canadian Centre for Bio-Ethical Reform, "who put kids to work distributing flyers featuring graphic images of aborted fetuses." A review of the Canada Summer Jobs program was sparked after iPolitics revealed last year THAT the Canadian Centre for Bio-Ethical Reform received $56,000 in funds from Liberal MP Iqra Khalid. "Is the member opposite saying she is opposed to reproductive freedom?" Hajdu shouted over loud heckling from the other side. "I wouldn't take that values test either," Vecchio said back, before noting that the government's attempts to clarify the attestation last week have not eased concerns of faith-based groups. Vecchio again called for the attestation requirement to be scrapped and for the Feb. 2 deadline for applications to be pushed back to accommodate groups who feel excluded from the process. "While the member opposite says she would not attest to supporting the Charter of Rights and Freedoms and a woman's right to choose, we know that government funding should never go to undermine Canadians' hard won rights and freedoms," Hajdu said, causing more jeers from the Tory bench. Vecchio later took to Twitter to note that Liberal MPs essentially forced her to become chair of the status of women committee — against her wishes — because they did not want Tory MP Rachael Harder, who is anti-abortion, to serve in the role. "Sorry Minister, but you tried to entwine a Member with a pretty solid record and beliefs," Vecchio wrote.